What are the effects of quantitative easing on Malta Government Stocks, asks Mark Vella. Malta Government Stocks are synonymous with the Maltese investor. Retail investors have historically found comfort in the stability in MGS pricing and built wealth by continuing to invest more money in MGS. But effectively, how much wealthier are Maltese investors, or rather, holders of MGS, following the announcement of quantitative easing by the European Central Bank on January 22, 2015? Much has been said in the media towards the end of 2014 that the overall eurozone economy was in the doldrums and price inflation was close to inexistent. This placed the ECB under pressure, which it inevitably succumbed to earlier this year with the announcement of €60bn worth of monthly asset purchases, commencing from March 2015 for a period of at least 19 months until September 2016. The ECB’s main target is to achieve its inflation target of two per cent and ultimately revitalise the single currency area’s economic activity, by providing liquidity in the markets and correspondingly expanding its balance sheet. This meant that the ECB, via its regional central banks, was given the task of purchasing domestic government bonds through the secondary market. The Central Bank of Malta had its role to play here too, and that is of purchasing €36m worth of MGS each month for the duration of the programme. There was a six-week time gap between the announcement of quantitative easing and the actual implementation of the programme, which served for all types of investors to position themselves for the anticipated wave of ECB bond purchases. This resulted in a marked appreciation of eurozone sovereign bond prices, with the larger price and yield moves being experienced at the longer end of the curve. There was a large rally which ensued and MGS prices were not immune to this euphoria with the benchmark bonds reaching unimaginable levels. MGS historical lows (yields) were being registered almost on a daily basis, as did other European sovereigns. The 3.3 per cent MGS 2024 and 4.1 per cent MGS 2034 increased by 6.43 per cent and 18.52 per cent respectively since the beginning of 2015 on a total (gross) return basis. The issuance of €180m MGS in February and March did little to dampen appetite for paper as these two new issues were heavily over-subscribed, most notably the newly issued three per cent MGS 2040. 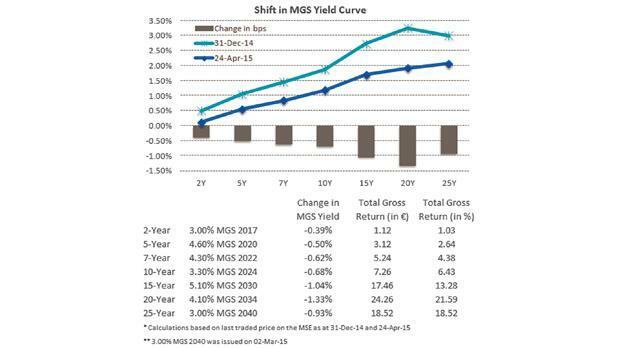 Activity on the secondary market picked up too across all segments of the MGS yield curve. The direction of MGS prices takes cue from the daily CBM bid prices which in turn are reflective of yields across the eurozone, with the CBM traditionally pricing MGS at a spread over similar dated German government bonds. Before, whenever an investor wanted to sell their MGS holdings and did not find a buyer on the secondary market, the CBM acted as a buyer of last resort and served to provide liquidity in the market. This dynamic has not changed. However, there is a new player in the market: the division within the CBM responsible for quantitative easing purchases for minimum quantities of €100,000. The dearth of supply – mainly due to the fact that at least a third of outstanding MGS is held by retail investors – from existing MGS holders propelled the CBM’s quantitative easing desk to outbid the CBM as its mandate to buy €36m worth of MGS on a monthly basis left them no option but to aggressively pitch for MGS. This has further accentuated the positive trend in MGS performance. And following comments by the CBM Governor on The Sunday Times of Malta last month, namely that the CBM is 45 per cent behind schedule, I would not exclude persistent aggressive bidding. Unless of course it resorts to bond purchases of the European Investment Bank, which I think would really be a last resort. That is essentially what quantitative easing is about: achieving price inflation through the appreciation of assets and using that additional liquidity and incremental value in wealth by consuming more. This hopefully will shore up the eurozone economy, which has, since the start of 2015, already started showing signs of a sustainable recovery. While the quantitative easing trade is a short-term trade, any gain which investors are comfortably sitting on right now is unrealised. If and when inflation and economic activity pick up, MGS prices could come under pressure resulting in gains being eroded unless these are crystallised by closing off the position, in whole or in part. Mark Vella is an investment manager at Calamatta Cuschieri. The information, views and opinions provided in this article are being provided solely for educational and informational purposes and should not be construed as investment advice, advice concerning particular investments or investment decisions, or tax or legal advice. Calamatta Cuschieri & Co. Limited does not accept liability for losses suffered by persons as a result of information, views or opinions appearing in this article. Calamatta Cuschieri & Co. Limited is licensed to conduct investment services in Malta by the Malta Financial Service Authority. For more information visit www.cc.com.mt.